You did a great job on the background~ It's amazing~~~ The river looks so realistic; it seems it's just part of original background~ and it matches the sky! nice wallpaper, the background is well done. In terms of looks, they're the perfect couple. Awww, it's so pretty. Love the background. Specially the water. It's a tad bright, but who cares! A fave from me! It's a beautiful wallpaper... sadly it's too small to fit my desktop =( so I can't say that I enjoy it. Anyway, thanks for making it ^^. wow,ur wallpaper agn,i reli like u draw wallpaper! I love the background ! Wah! Adorable couple! This is beautiful. Sakura y Shaoran son para mi, la mejor pareja de Clamp, excelente wall, felicidades! ahhh! I love it! 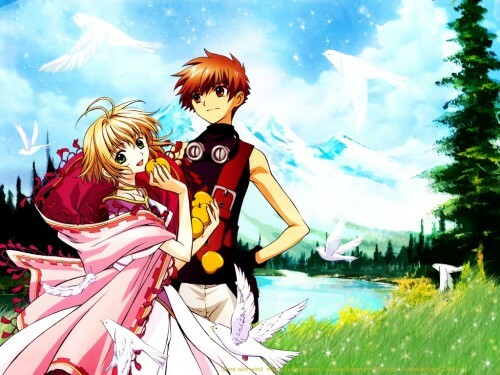 Syaoran & Sakura kawaii!